From the terrace of my rooftop room at Casa Felipe Flores, I can hear fireworks and the brassy sound of a mariachi band playing in a small parade for the patron saint of a local hospital. I’m surrounded by pine trees and palms, and at the edge of this city, San Cristobal de Las Casas, in Mexico’s southernmost state of Chiapas, are lush green hills. Courtyard at Casa Felipe Flores, San Cristobal. Anyone who even glances at the headlines knows that these are troubled times in Mexico. The drug-inspired violence in the northern part of the country has made a serious dent in tourism, one of the country’s lifeblood industries. So it was inspiring to listen to Mexican President Felipe Calderon talk with passion last night here in San Cristobal about the country’s commitment to adventure tourism. Calderon, speaking at the opening of the Adventure Travel World Summit, made it clear that Mexico has many treasures, natural and cultural, adding that sustainability was among the country’s biggest concerns. A good place to start exploring the treasures of Mexico is here in Chiapas, a state unknown to most Americans used to visiting beach resorts like Cancun and Puerto Vallarta. Here at 7,200 feet above sea level lies a venerable colonial city, in the heart of Maya Mexico. “Ah, you are going to the real Mexico,” said a Mexican acquaintance in New York when I told him where I was headed. It turns out that the “real Mexico” takes work to get to – a nearly five hour non stop flight from JFK to Mexico City, followed by another flight of about 90 minutes to Tuxtla Gutierrez. Then there’s a 90 minute drive or so through the mountains to San Cristobal on roads often cloaked in fog. The chapel at the cathedral in San Cristobal. It was well worth the trip. On the streets are natives selling locally made and brightly colored textiles. 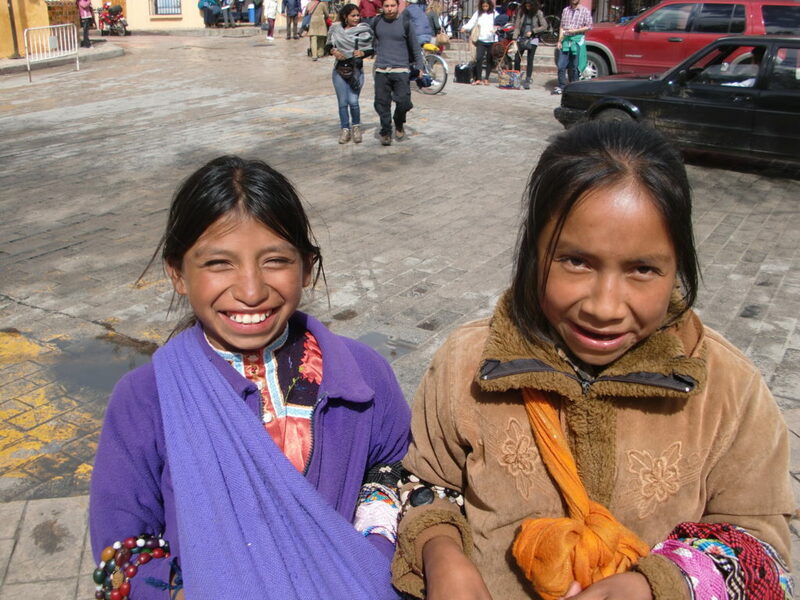 They are descendents of the Maya from nearby Chamula, wearing black wool tufted skirts, or women from the village of Zinacantan, wearing black capes. There is a lively zocalo or plaza where mariachi music is played, hole in the wall cafes with guitarists and a handful of nicer restaurants aimed at gringos where yes, even more music is played. Across from the zocalo is the cathedral, whose thick stone walls of red and yellow are a bright dash of deep color in an already colorful town. Backpackers, new agers and Italian and German tourists mix with the locals. You can live cheaply here – a coffee, made from locally grown fair trade beans, is among the best in Central America and will set you back a dollar. A Corona is less than $2, and a meal can be had for $5. At El Mercadito (Diego Dugelay 11) my entire lunch — delicious and fresh chicken mole and rice – ran about $3. You can visit Na Bolom, a hotel in a compound that was the home of the Danish anthropologist Frans Blom and his Swiss photographer wife, Gertrude Duby beginning in the 1920’s. Now a hotel and a museum to their work in Chiapas – in early photographs he looks for all the world like a real-life Indiana Jones – is a glimpse into a lost Mexico that existed here pre- and post-war, the country of Diego Rivera and Frida Kahlo. A half hour’s drive from San Cristobal’s narrow streets brings you to Chamula, where the scene at San Juan de Chamula is like something out of the middle ages: a centuries old Catholic church where no priest may enter, a veritable forest of candles burning on the stone floor, and Maya shaman rubbing live chickens over the head and shoulders of the afflicted. Coca Cola is drunk ritually and the praying natives chant in Tsoztzil, one of the Mayan languages. 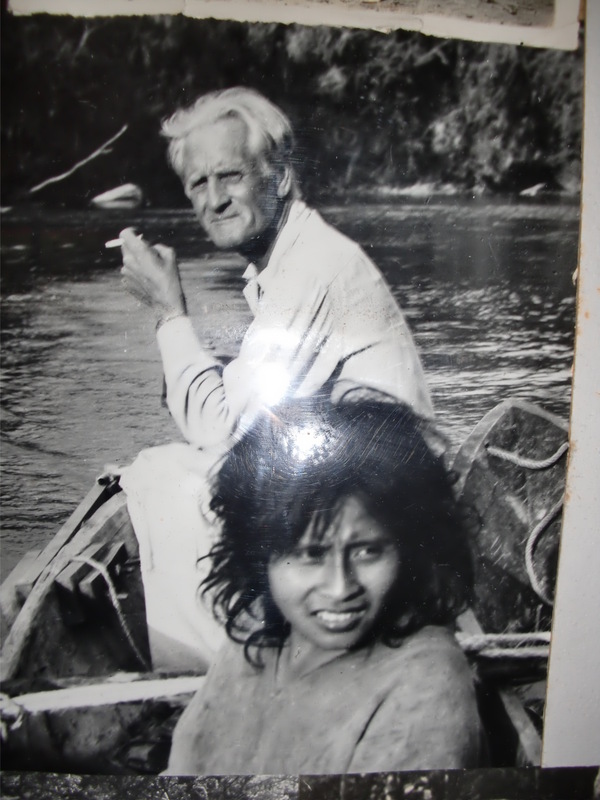 If you know anything about Chiapas, it might be a recollection of the Zapatista Rebellion back in 1994. That uprising is long over. “The irony is that Chiapas is probably now the safest place to be in Mexico,” says David Orr, an expatriate American, who owns and runs Casa Felipe Flores with his wife Nancy. It’s a dream of a Mexican colonial hotel and they extended one of the warmest welcomes I’ve received in some time. The Orrs bought and restored the old house 20 years ago and opened it as six-bedroom inn. In typical Mexican fashion, the stone exterior faces onto the street and gives no clue of the interior. 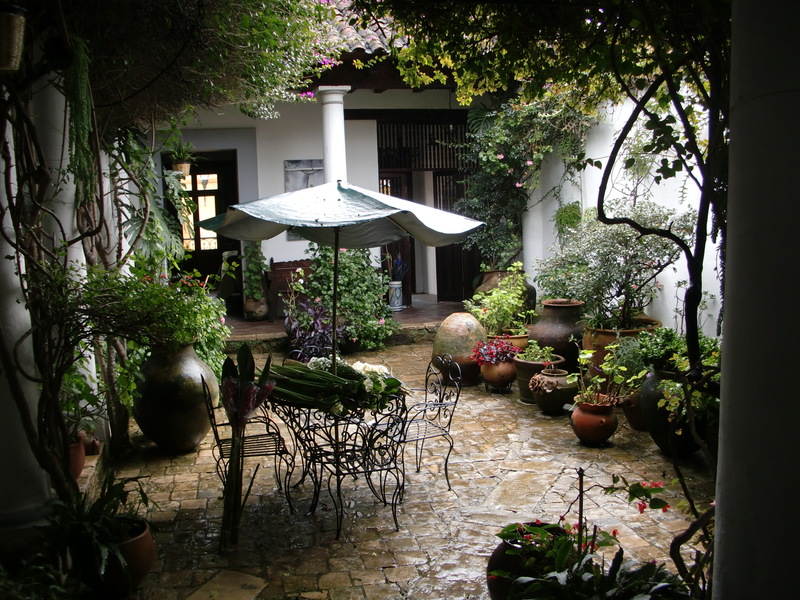 But step inside and you enter a courtyard filled with lush plants that’s open to the sky. 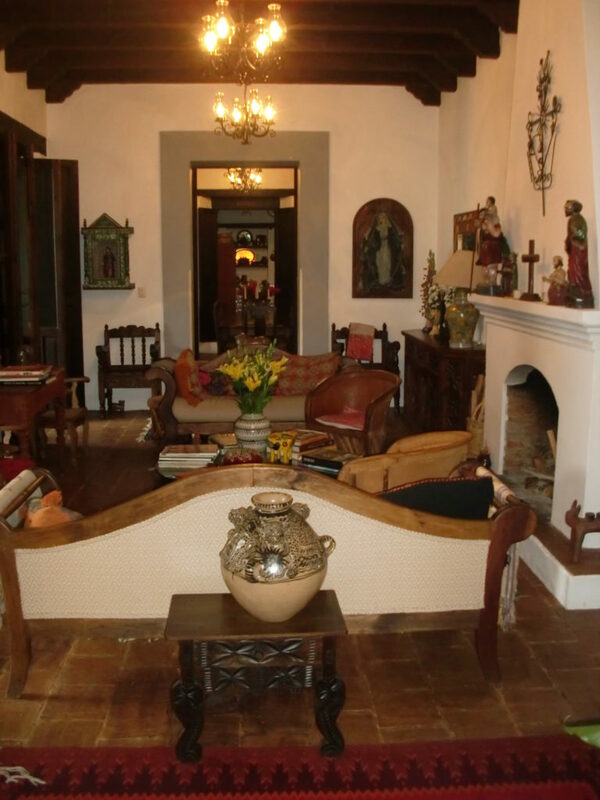 There is a living room with a fireplace, statues of saints from Guatemala, an assortment of contemporary artworks, and some of the textiles that Chiapas is known for. It feels like 19th century colonial Mexico come to life. There’s an elegant dining room where breakfast is cooked to order. Several guestrooms lead off from the courtyard and there’s a passageway to a second courtyard, with columns, more plants, more guestrooms. 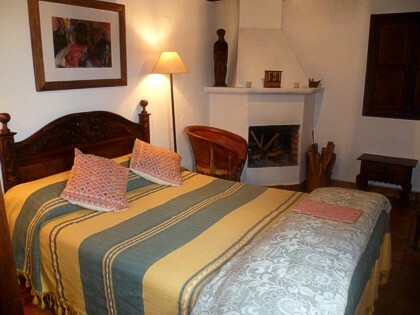 Each guestroom has similar antiques and artworks, as well as a fireplace. “We added the back building, which was where the previous owners, who had been here for 50 years, kept animals and had an outdoor bathroom,” David Orr says. But I liked my room the best. It was located on the roof, reached by outdoor spiral stairs. The room itself is a small cube, perhaps 8 x 10, with a beamed ceiling, tile floors and two windows. I slept under a welcome duvet and an electric blanket, because here in the mountains, it can get chilly at night. Thankfully, there was also a corner fireplace where I lit a small fire of pinion logs which burned aromatically. The mantle was topped by a hand carved wooden Guatemalan statue of a saint. The bath was compact but nicely done with bright Mexican tiles. The best part may have been the private terrace with table and chairs, with a view over the neighboring buildings to the green hills. It was an aerie, a meditative sanctuary in the heart of Maya Mexico. To my mind, it was perfection. San Cristobal is not the Mexico most of us are used to. The cafes and streets are shared with locals, not quarantined for tourists. It feels a bit like the 1950’s or 60’s here, and that’s not a bad thing. You’d have to go a long ways to find a city more charming than San Cristobal, and a colonial inn more engaging than Casa Felipe Flores. In these troubled times, they are shining examples of what’s so inviting about Mexico. Casa Felipe Flores, San Cristobal de Las Casas, Chiapas, Mexico. WHen I was in Chapala, a chicken was being sacrificed in the church. San Cristobal is the real “Indian/Mexico.” Or, Mexico as it was 500 years ago. Not the Mexico that has had so much European influence. So glad Casa Felipe Flores is still the best. Glad you liked, it. I have you and Arthur Harris in the back of mind as I explore this amazing place. Viva Chiapas! 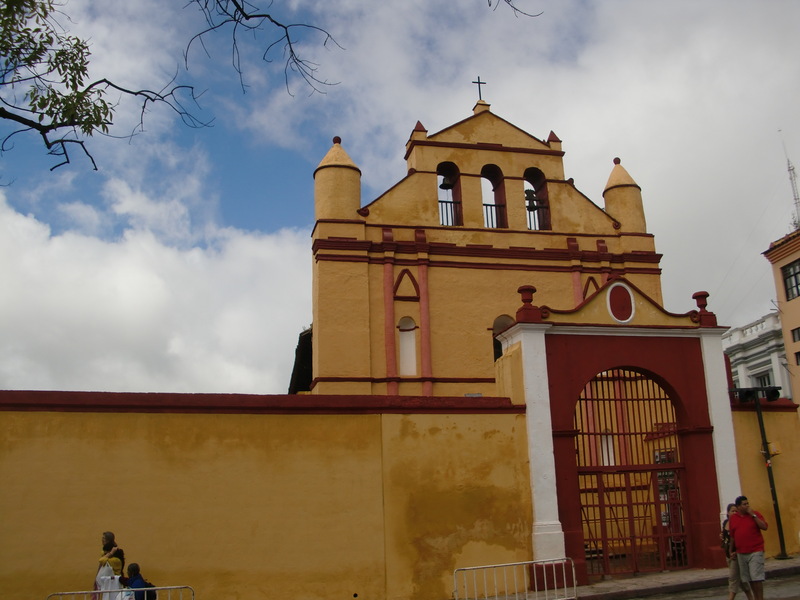 Your article captures many of the thoughts and feelings I had while in San Cristobal de las Casas. Something else I thought was special was that the pedestrian zone and other downtown streets were used heavily by locals … not just us visitors. In the evenings, the cafe terraces were full of locals and late one morning I happened across a long line of young school children in uniforms, with teachers, walking through the light crowd of vendors, shoppers and conference goers. Thanks Allie – and regards to Toni wherever she may be trekking in Asia! Wonderful piece. Within moments of arriving in San Cristóbal I too was charmed by the place. I look forward to seeking out some of Mexico’s other Pueblos Mágicos. Nice report on San Cristobel – indeed a special little place – Loved my time there whilst at the ATTA Summit recently. Cheers for you input on the media talks there .. found it really useful!! Glad you liked the story and the media session, thanks!